Congratulations to Gianfranco Paolozzi, Harumo Sato and Rose Margaret on their moment in the spotlight at a packed house at the Cinequest grand Closing Night. Rose was presented with an award for her wining "Unexpected" painting and all the artists were recognized with a standing ovation. The paintings are quite remarkable and available for purchase if you'd like to acquire one of them. Please email us at info[at]phantomgalleries[dot]com for pricing info. Rose Margaret is a painter, wood-burner, caregiver, composting enthusiast, student of permaculture, and muncher of plants. She does her best to support Mother Nature's wellness on a daily basis. “This piece is dedicated to people who suffered from a big earthquake in Japan 8 years ago, called 311 earthquake. Harumo Sato is a California based Japanese visual artist who graduated from University at Buffalo in 2015. In questioning our busy and highly industrialized daily lives, she translates old mythological analogy and allegory imagery into modern, colorful, and unique visual images. She has a strong interest in pattern design which has traveled through many cultures and contexts over the centuries. 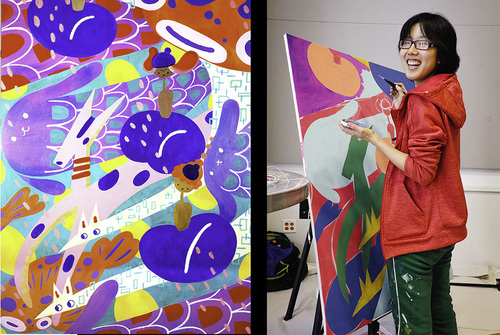 With the various colorful materials like screen prints, Japanese watercolor, sumi ink, and acrylic she seeks visual pleasure and vivacious energy to open the viewer's mind. 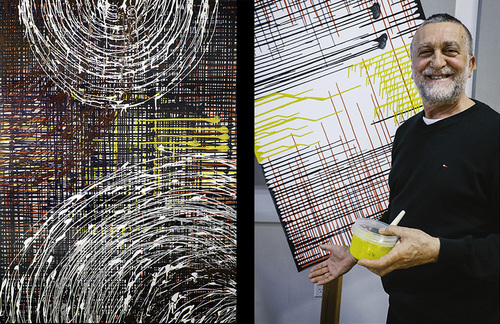 Gianfranco Paolozzi is as much a conceptual artist as he is a painter. Each painting is considered a memory journal....the painting evolves over time, just as our memories seem to. The "finished" date of the paintings are a date of abandonment rather than completion. 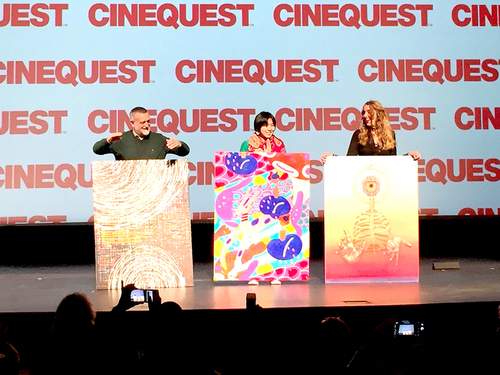 A very special Thank You to the entire Cinequest family for their support of these artists and Phantom Galleries each year. This page contains a single entry from March 18, 2019 9:10 PM. 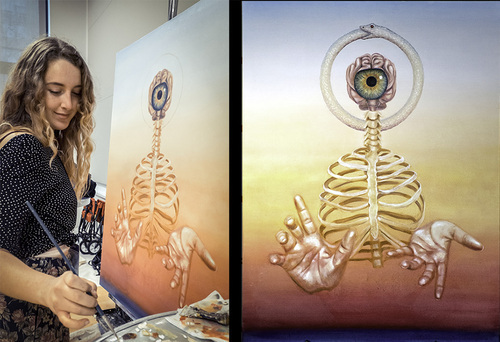 The previous post in this blog was Recognition of Live Painters at Cinequest Closing Night Event. The next post in this blog is TWO BUCK Tuesday at KALEID Gallery March 19th.